Following the barrage of rain across Derbyshire caused by Storm Bronagh, sunshine is set to return to the county. 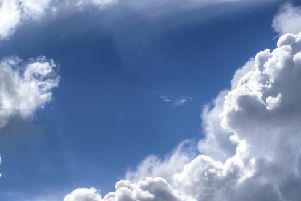 While the temperature will not be soaring to the highs seen over this summer, blue skies will be a welcomed sight over the coming week following a rainy start to the weekend. The Met Office's weather forecast for Derbyshire predicts an average temperature of 14 °C this week, however Wednesday and Thursday could see highs of 19 °C. Cloud and early rain soon clearing southeast, then turning brighter with sunny spells. Cloud building with showers developing for the afternoon. Some of the showers might locally becoming heavy, especially near coasts. Breezy and feeling rather cool. Maximum temperature 14 °C. Showers dying out with some long clear spells for most areas. Northwesterly winds will remain rather brisk near coasts. Turning cold in many parts with a probable grass frost. Minimum temperature 3 °C. Monday will be mostly sunny though remaining rather cool with a few afternoon showers possible. Winds falling light later. Maximum temperature 15 °C. Chance of some patchy light rain Tuesday night, otherwise dry with sunny or clear spells. . Overnight mist or fog in places. Feeling warmer by Wednesday and Thursday.